4 - 6 months, vaccination against clostridial diseases, worming, vitamin paste during the winter and of course shearing annually. Shearing is carried out by a professional shearer who will visit you to carryout the task, which only takes a few minutes per animal. 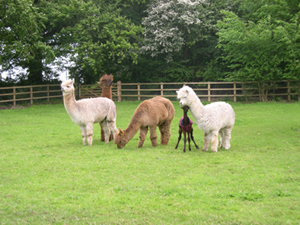 We also check and body score our alpacas on a weekly basis to ensure they are in peak condition. You can learn how to carry out these tasks yourself on one of our courses or if you are one of our customers you can use our unique mobile service where we come to you and and carryout all your alpaca's husbandry needs or assist you in side by side training until you feel confident enough to take the tasks over.